It is ‘Cyber Monday’ and ‘Black Friday’ time – again! All retailers are ramping up their offers and claim to be offering really good prices. Great Deal? or Marketing Scam? Having trouble, like three-quarters of Americans, with the math necessary to determine the real value of an advertised sale? Then use these online calculators to find out whether the discount is really worth it and how high your savings are. Black Friday is the number 1 shopping day of the year. Shops’ prices are reduced for minimum a day (often up to a week) in an attempt to get customers starting their Christmas purchases. Cyber Monday is another important sales day to look out for. The most commonly used discount is a percentage reduction on the original sales price. These reductions are normally promoted on Black Friday or Cyber Monday by showing the old price slashed and the percentage of savings in the new price, in absolute numbers. X for Y offers are also very common, where X is the number of products you may get and Y the number of products you may have to pay for. While consumers have the impression that prices are slashed to a historic low level for Black Friday, only 48 % of these products are actually cheaper than at some other time during the year. Consumers should also be wary of getting ripped off on Black Friday. Watch out for decoy offers, unrealistic discounts, artificial scarcity, hidden costs, and more. A shocking number of Americans are unable to calculate percentage discounts without a calculator. This means shoppers are often not making the best decisions when comparing offers. Part of the problem is that seemingly big discount numbers appeal to consumers’ emotions, while the logical portion of the brain checks out. More details about this can be found in our consumer study here. Caution: Do not blindly trust the stated original price, which is often the so-called manufacturer´s suggested retail price (MSRP). In many cases, these are fantasy prices which are hardly ever paid by anybody in reality. You should always compare with alternative offers in other stores or online. Very often you may find offers that are structured in the following way: X for Y. Where X is the number of products you may get and Y the number of products you may have to pay for. Or in simple terms: a 2for1 offer for Shirts means that you get 2 Shirts but only need to pay for 1 Shirt. A 2for1 offer is often mistakenly interpreted as a 50% price reduction (2 Shirts = 20 USD so 2for1 means 2 Shirts for 10 USD). But: normally retailers add fine print to these offers where it is stated, that only the cheapest item is the one which is for free. That means if you buy an expensive Shirt (i.e. 20 USD) and a cheap Shirt (i.e. 5 USD), that your price reduction would only be 5 USD (or 20% of the combined price of 25 USD). Caution: Delivery cost, sales taxes and other hidden cost can reduce your discount significantly. So please check carefully before pushing the buy button. How do you find the percent of discount? How do you calculate the percent off? To calculate the percent off you need to know the original price amount and the new price amount. Then you divide the new price amount by the original price amount. You will get a number that is smaller than 1. Then you have to substract this number from 1. Finally multiply this with 100 to get the percent off value. How do you find the original price? The original price calculator is an online calculator that helps you to find the original price from its sales price. All you need is the sales price and the percent of discount to calculate the original price. Does it really make sense to buy on Black Friday? The simple answer is: it depends. You can indeed find some hefty price reductions in stores and online during the Black Friday sales period. That´s undebatable. The challenge is to find them and eventually get the hands on the limited capacities. Most retailers claim to be offering significant discounts. But many of these discounts are difficult to understand or calculate. And a lot of dealers use lure offers – see our full study on Black Friday Scams here (pdf, new window). Customers should for sure compare prices properly before they purchase the goods. Some bargains look better than they actually are. One major risk of Black Friday is that customers fall into a shopping mania and purchase items that they not really need but just buy because they appear to be cheap. So, if you have been bargain-hunting for an expensive product already for months and it turns up in one of the many Black Friday mailings, you should catch the opportunity. Also, good deals on Children toys for under the Christmas trees or Cashmere scarfs for your loved ones can be easily found during Black Friday. With Electrical Appliances or other Consumer Electronics, you should be more cautious and research the offers before buying. Energy consumption is a potential hidden cost to consider as well. We tracked prices of more than 100 tech gadgets such as tablets, cameras, and large household appliances over the period of one year on major online-shops in the US. While consumers have the impression that prices are slashed to a historic low level for Black Friday, only 48 % of these products are actually cheaper than at some other time during the year (54 products). How can I make the best deals? Did you wait until Black Friday to buy an expensive product? Please do a proper research online in advance to see the average price of the product. Often, discounts are not as good as they appear. Comparison websites such as Google shopping are perfect tools to find out whether the Black Friday offer is really an offer you cannot resist. In retail stores, it is unfortunately unavoidable to queue up early in the day. The most exciting offers may otherwise be sold out already after a few hours. Obviously online there is no physical queue but also here speed is of essence. Check at what exact time the offer becomes available (don´t forget to factor in your time zone) and try to buy in the first seconds. Otherwise, the best offers can be gone very fast. In case you already know, which online shop offers your preferred product, it is recommended to create your user account on shop´s websites in advance. You can even try putting these items in your virtual shopping basket before the actual sales period begins. The most expensive purchases are actually shoes that you buy online and don’t wear afterwards because they don’t fit. Avoid this by using this shoe size calculator for adults or these shoe size chart for kids. Many retailers hand out Vouchers already during the weeks before Black Friday. To avoid delivery fees when ordering a discounted item online or adding additional rebates for sale items, it makes sense to keep your eyes open. Merchants often entice new newsletter subscribers with generous discounts. Just subscribe to the newsletter and you’ll receive a discount voucher. You can always unsubscribe, so you can save money easily with just a few clicks! Savvy savers even use multiple email addresses to cash in on more discounts. Also following the retailers on Social Media such as Facebook or Twitter makes sure to get relevant information about great deals first. For example, Target’s REDcard or Amazon Prime membership are essential tools for any successful Black Friday deal. With these, you will enjoy additional discounts (Target additional 5% rebate), free shipping on all offers with no minimum, or early access to special offers. Most of these memberships come free of charge. Amazon Prime does cost but also gives you access to free Video or Music streaming and other benefits. In case you are not yet an Amazon Prime member and are not willing to pay for it eventually, you can simply cancel your free trial after 30 days. Eligible students can even receive a free 6-month trial. Focusing only on Black Friday for striking good deals is not always the best strategy. Most retailers offer great discounts well in advance and in the following days till Cyber Monday. For example, Amazon’s ‘Countdown to Black Friday Deals Week’ has already begun and it is recommended to bookmark Amazon’s Black Friday page as new deals will become available daily. Be ready for Amazon’s Black Friday sale on November 17th. Amazon regularly runs its Black Friday offers and Cyber Monday offers for eight days straight. Target, for example, offers early access to special offers for RedCard holders. Have a preview of Target´s exclusive Black Friday online-only deals. Purchases can be made on Target.com on November 22 beginning at approximately midnight. Black Friday deals for REDcard holders will be revealed on November 22. Target also offers a bonus: Free shipping on most orders and free same-day pick-up in store. Even after Cyber Monday, you can find superb “left-over” deals if you don’t need to follow the mainstream (i.e. because you need smaller or larger than average clothing). Many stores will offer specific items that will be drastically reduced in price. However, very often these offers are only available in very low quantities. These offers are used to get customers into the store in the first place. Once in the store often they are sold out and the retailer may talk you into purchasing other goods which are potentially not so attractive. Many online retailers advertise with great savings for products but if you look into the fine print, the shipping cost can eat up the savings. Amazon offers free shipping on all orders of $25 or more also for non-Prime members. But orders only arrive after 5-8 business days. In contrast, e.g. Target or Best Buy offer free shipping on all orders (no minimum) during Black Friday. So always look at the total price including shipping cost. You should always have a backup plan to purchase your beloved product on Black Friday. While a specific retailer may have the best deal, this product can be sold out very quickly. So, it is recommended to look also for the second best offer in advance to make sure you can at least strike a deal. A decoy offer is a misleading advertising measure for a particularly cheap offer, which is not available in sufficient quantity to inspire the attracted customers for a more expensive product. You probably have experienced that already. In the brochure, you found an offer for a digital camera, which seemed so good that you couldn’t resist. Immediately you jumped into your car and drove to the nearest branch. Once there, you have been told that the offer was no longer available, but of course, other good digital cameras were on offer. 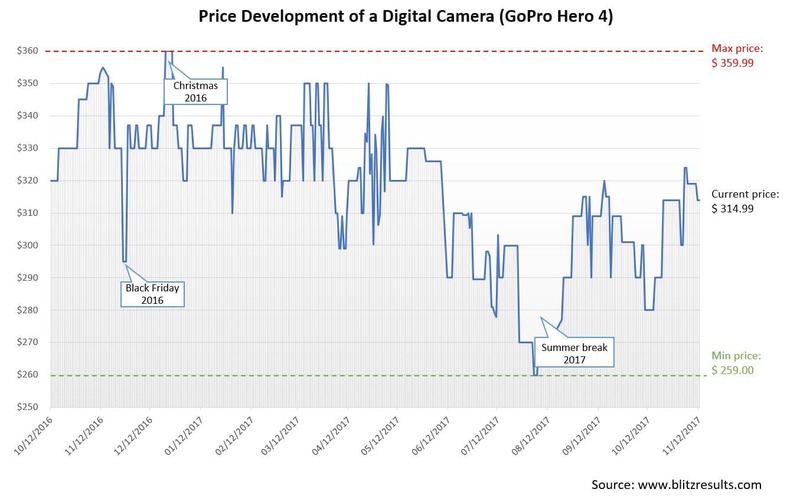 When you arrived home after the purchase, you noticed that you could have bought the same camera even cheaper at a different dealer. You’ve been put on the line by a decoy offer. High double-digit discounts sound like music in our ears. But be careful, the discounts advertised are often calculated based on the manufacturer’s suggested retail price (MSRP). These sales prices are actually never paid, especially in the electronics sector. Studies show that discounts are sometimes half as low when compared to a comparable non-reduced offer from other retailers. Last year’s products have often become a shelf warmer when there are newer versions with enhanced or better features on the market. These products are offered on Black Friday with particularly high price reductions. But a closer look at the more recent product is sometimes worthwhile. It may well be that these have useful extra features, for which one is already paying a few dollars more. Also, you can usually find these shelf warmer products with high discounts even on normal days. If you are ready to buy older models, you can relax and save yourself the trouble of Black Friday. Energy consumption is a potential hidden cost to consider as well. 18 megapixels, 1TB, UHD 4K – who knows exactly what these values mean and whether you really need them? Do not be dazzled by these values. For most users, models with significantly less horsepower are more than sufficient to meet their daily requirements. These can be purchased at very reasonable prices and thus save considerably more than an apparently good discount on a top model. Don’t get stressed. It is often suggested that offers are only available for a short period of time or in a certain quantity. Prepare for Black Friday. Find out whether other comparable offers from several providers are available. So that you have a plan B when the product is sold out. You should also check whether there are any other branches of the retailer in your immediate vicinity or in less frequented districts. Usually, each store gets a certain quantity of an offer assigned. Calculate exactly how high the final price will be in the end. Shipping costs, taxes or incomprehensibly formulated discount structures often result in the originally promised high double-digit percentage reduction shrinking into a meager remainder. Since the calculation of some discount offers can be quite complicated, make sure to use our discount checking tools above, which allow you to calculate how much you really save with just a few clicks. Customers in the US generally benefit from one of the world’s most service-oriented environments. 90 days of return rights are standard, whether online or offline. However, special offers on Black Friday often have limited or no return rights. Pay attention to the small print, take a close look at the products and check them for errors as far as possible. You should definitely try on clothes to avoid bad surprises at home. Black Friday is the number 1 shopping day of the year. Shops’ prices are reduced for minimum a day (often up to a week) in an attempt to get customers starting their Christmas purchases. During the sales period, retailers often have different special discount days. Cyber Monday is another important sales day to look out for. While Black Friday was originally an American thing and most people in the UK probably hadn’t even heard of Black Friday. Now it is a key date also in the British shopping calendar. Black Friday is always the day after Thanksgiving – an American holiday which is always on the fourth Thursday in November. In 2018 it will be November 23, and in 2019 it will be November 29, 2019. However, since years Black Friday is not a one-day event any longer. Many popular retail and online stores start their Black Friday Sales long before. Amazon for example already started with first Black Friday offers on November 17, 2017. Are there any risks to be aware of on Black Friday? Internet fraudsters are trying to profit from the bargain frenzy on the net, warned the U. S. FBI. Because the discount hunt on the net regularly makes shoppers become careless – and the criminals know that too. Watch out for offers that are too good to be true! Cyber-criminals regularly open their own Black Friday fake web shops to advertise extremely inexpensive branded products. Whoever buys here probably doesn’t see his money again. Phishing mails with false discount codes are also a preferred means of attracting criminals. The advertised vouchers or sweepstakes are false, the perpetrators are only trying to persuade their victims to enter personal data such as the credit card number. There are multiple explanations why the day is called Black Friday. One explanation is that it is the day when shops move into the “black”, meaning they make high profits. In contrast to operating at a loss which is called being in the “red” in accounting terms. This apparently seems to work. Customers often queue for hours and days, to get a good deal. But this is not the correct explanation. It was originally called Black Friday because it resulted in traffic accidents and sometimes even violence. Too many customers went on the streets at the same time to acquire their beloved products at an affordable price. The Philadelphia Police Department hence called the day Black Friday to describe the turmoil and chaos it created. Unfortunately, the shopping obsession can sometimes even today end up in violence and even shootings, as people fight over the best bargains. In 1905, the Canadian department store Eaton’s began the first Thanksgiving Day parade in downtown Toronto. This parade grew larger and larger since then and inspired Macy’s Department Store in 1924 to launch its famous Thanksgiving Day parade in New York City. This parade boosted shopping for the following day. Since the early 50s, Black Friday became the official start of the Christmas shopping season in the States. People started calling in sick to enjoy a four-day weekend. Also – as shops were open – they could get a head start on their Christmas shopping by doing this. While Black Friday is not an official holiday, California and some other states have declared it as a holiday for state government employees. Rather than arguing with their employees, many businesses started adding that day as another paid holiday. 4 How do you find the percent of discount? 5 How do you calculate the percent off? 6 How do you find the original price? 7 Does it really make sense to buy on Black Friday? 8 How can I make the best deals? 10 What is Black Friday? 11 When is Black Friday? 12 Are there any risks to be aware of on Black Friday? 13 Why is it called Black Friday? 14 What is the history of Black Friday?